I have nothing but unqualified praise for this exquisite place. 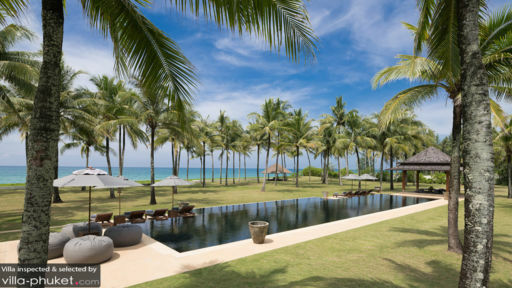 It is situated on a glorious long but quiet beach a few miles north of Phuket airport but far away from the crowds and tat of what sadly most of that hitherto lovely island now boasts. This is sheer heaven and a place to restore one's energy, totally relax and forget the troubles of the world. I could not recommend it highly enough. There are lovely gentle staff to take care of your every need with a smile; totally delicious food; so much space and so many choices to place yourself. The individual little houses have a bedroom with the most wonderful views of palm trees and the blue ocean and a large bathroom set into an exotic oriental garden. The large swimming pool is wonderful & great for doing lengths against the backdrop of the gentle waves lapping the spotless beach. If you really have to keep in touch with the real world there is WiFi. All in all a blissful dream and worth every penny! We stayed with friends including their daughter, son-in-law and grandchildren. The setting was just unbelievable - beautiful grounds looking straight out over the (deserted) beach with palm trees waving in the breeze and sunsets to die for. We each had a separate villa with large and comfortable bedroom, dressing room and spacious bathroom. The staff were superb, totally friendly, always helpful and nothing was too much trouble and the cook was just fantastic. We've always liked Thai food but day after day, the most delicious Thai dishes would appear, each better than the last and then, when I realised that I was missing my good old English breakfast, the most perfect eggs and bacon appeared! And I could even justify it by swimming 20 lengths of the glorious 25 metre pool every morning. Then there were long walks on the idyllic beach, ending up with drinks at a beachside bar before turning round and returning. The place was very children friendly and they seemed to have a wonderful time with their own paddling pool and plenty of room to play without being all over us oldies. My wife and I have never had such a luxurious and relaxing holiday. This is a special place. We stayed here for 2 weeks with family including young children and had the most idyllic holiday. The location is perfect with sea views and access to an endless stretch of unspoilt beach. The view is visible from your own luxurious pool which has the benefit of a discreet shallow smaller pool which our children enjoyed for hours on end. The villa caters perfectly for groups allowing privacy in your own separate mini villas yet several large areas to socialise together. The buildings and interiors are beautiful and so open allowing you to really enjoy the climate. In addition the plentiful food could not be faulted. We hope very much to be able to stay here again in the future. Ananda is the pinnacle of understated, elegant luxury. It is half an hour north of Phuket airport in the car, which means it is off the main island. This, to us, was a considerable bonus. If you want to sample the delights of Patong beach etc, Ananda is not for you. Otherwise, Its location is quite simply sensational: right on the beach, and a beach that could have come straight from a postcard, yet with rarely a soul to be seen. It sits in a run of four huge properties that were obviously built at the same time. My (pathetic) competitive streak was delighted to note that Ananda seems to be notably bigger than the others, with larger grounds. 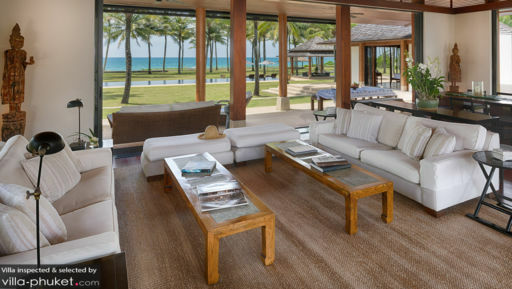 The property consists of six or seven separate villas, all with bathroom, all furnished with style but not swagger. The service is in tune with the decor - attentive but never overbearing. The food is authentic Thai, beautifully prepared without being fussy. Star choice: duck curry. At the same time if what you need is some noodles for the kids that can also be arranged - in fact anything, seemingly, can be arranged. We enjoyed massages on the 'Sunset Sala' most days, as the sun set over a limpid sea in what was an almost ridiculously idyllic scene. The property manages to pull off the trick of being both effortlessly stylish yet completely child friendly. Evidently it has been set up with both of these requirements in mind. Small touches like separate bunk rooms for the children with toys and TV, or travel cots or a shallow infinity pool just for the children, can make a huge difference to a family holiday. In summary Ananda is the perfect getaway for peace, tranquility and time with friends or family or both. I cannot recommend it highly enough and can;t wait to come back. 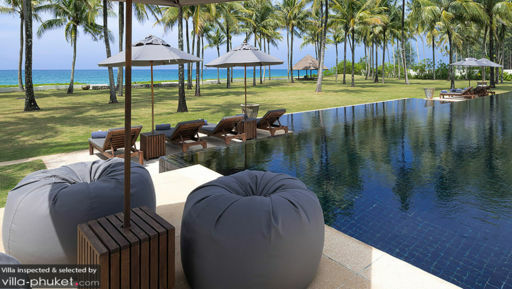 Ananda at Jivana has simply luxurious sea facing villas. Having stayed 5 sleeps at this stunning place..I have been woken up by the beautiful sunrise each morning along a serene view of the spacious garden's green grass and coconut trees ...just perfect to start a day off with. The beach is only a 10 second walk from the villa front and there is a beautiful infinity pool just before the beach if one would rather swim in the pool. The food served at Ananda was delicious authentic thai food and the service from the friendly staff was perfect. I'd definitely head back to this heavenly place for my next visit if I could ... for a business trip or a romantic getaway.. It's simply gorgeous. We have stayed at the wonderful Ananda on several occasions and it has always been heaven from beginning to end. The setting is just beautiful - acres of palm tree brushed beach frontage, two chic large pools, spacious and stylishly appointed rooms - some with hidden luxuries like a sunken outside bath. The staff are superb and the food absolutely delicious. Our children loved their time here and we had a very relaxing holiday, which is often hard to come by with small children. I cannot recommend it more highly. Copyright © 2019 Villa-Phuket.com. Chiamaci in Tailandia +66 60 003 5911 / Australia 1300 014 384 o +61 2 9191 7419 / Singapore +65 6871 8993.